Are Arsenal and Liverpool shocked to learn that if they offer hundreds of millions of pounds for a player they stand a decent chance of recruiting him? No. He’s not. Well, not unless Arsenal decided to spend hundreds of millions on one player and he’s painted by Picasso and Van Gogh. Yes. They will. Just as Barcelona will ‘consider’ selling Lionel Messi to Manchester United / Arsenal / Bournemouth / anyone for, say, £2billion. Make the number big enough and Manchester United’s owner would probably sell the club to Manchester City. A boost. 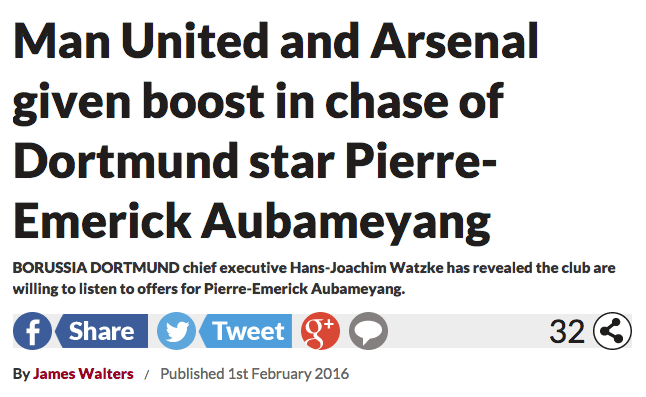 Being told the player will stray at Dortmund unless a team pays hundreds of millions is boost is a ‘boost’. Liverpool and Man United’s owners must be punching the air. 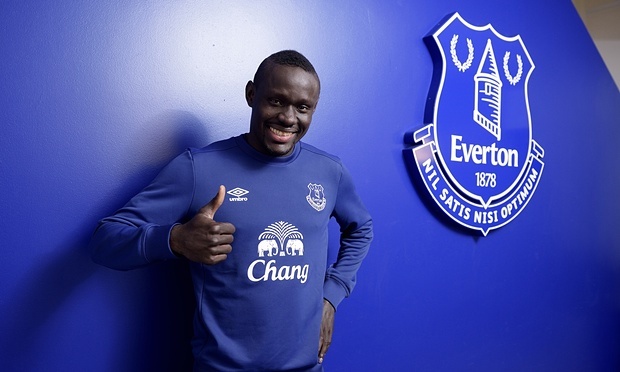 Transfer balls salutes the Daily Telegraph, which declares: “Everton close in on Niasse.” That’s Oumar Niasse, the Senegal international who has now joined Everton in a £13.5m move from Lokomotiv Moscow. “What does this have to do with Chelsea?” I hear you ask. Well, quite a bit, actually. You see, Chelsea are a team who get googled a lot, so if you have the word “Chelsea” in your headline you’ll get lots of clicks and the sweet, sweet literal fractions of pence that accompany each one. I mean, they’re googled enough to warrant a transfer blog all to themselves even though they’re not going to do anything (where’s my SJA nomination, come to think of it?). Anyhow, that means that a bunch of websites are retrospectively making Niasse a Chelsea target when reporting that Everton are going to sign him, even though they’d never mentioned Chelsea’s interest in the past. Chelsea transfer news and rumours: Chelsea poised to make £15million swoop for Oumar Niasse…Whilst Manchester United prepare to launch a £40million bid to sign his compatriot Sadio Mane… Chelsea are hoping to pick up more of a bargain in signing Niasse for around half of that figure. Having learned that £15m is about half of £40m, readers were also told that Chelsea and Tottenham wanted to sign the player. Mentions of Everton’s interest: nil. Such are the facts in the Telegraph. The news moves quickly – too quickly for the dead tree press. This morning, the Times leads with “Chelsea snub Terry hid for new contract”. News is that John Terry, the Chelsea captain, is to leave the club this summer when his current contract expires. He wants to stay but the club are happy for him to go. “It’s all over,” says the Mail. 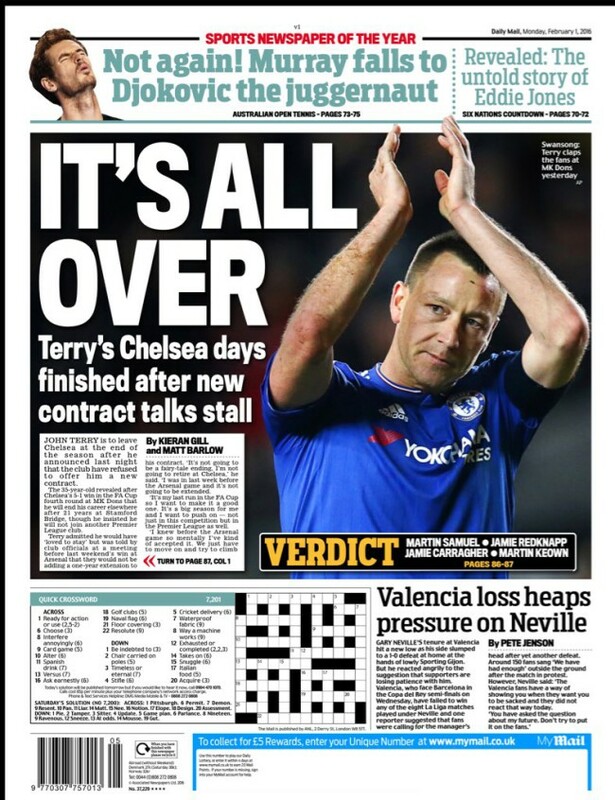 “Terry’s Chelsea days finished.” It’s the “Blues boot for JT,” says the big story on the Express‘ back page. “Captain. Lever. 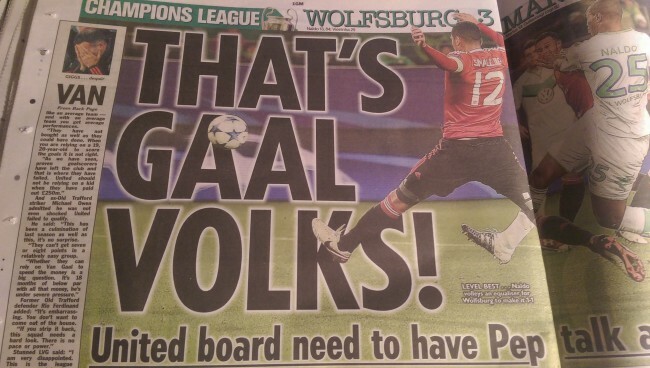 Legend,” puns the Mirror. “Captain. Leaader. Legend, Leaving,” retorts the Sun. So he could stay? He wants to. Stories of John Terry’s demise have been premature. John Terry, 35, says he’s leaving Chelsea this summer. The club haven’t offered their skipper a new contract. The best thing a non-Chelsea fan can say about Terry is that unlike many new fans who see Stamford Bridge as a stepping stone to the rugby and a nice tea, Terry hasn’t left the match before the final whistle. He stayed at the club until it not longer wanted him. He gave it his all. Now we await his book. It should be a good read – although we also expect it to feature entire chapters in parentheses with reams of footnotes lest any word be removed from context – cultural and historical – and misinterpreted, to be used against Terry in a court of law, football phone-in or controversial handshake. So there it is – the first newspaper report telling Arsenal fans the Gunners can win The FA Cup and Premier League ‘Double’. Newspapers love to talk of teams winning multiple trophies. They believe it quickens the fans’ hearts. It does if those fans are age 6 and below, or the type who started to follow Chelsea or Manchester City after the money arrived. 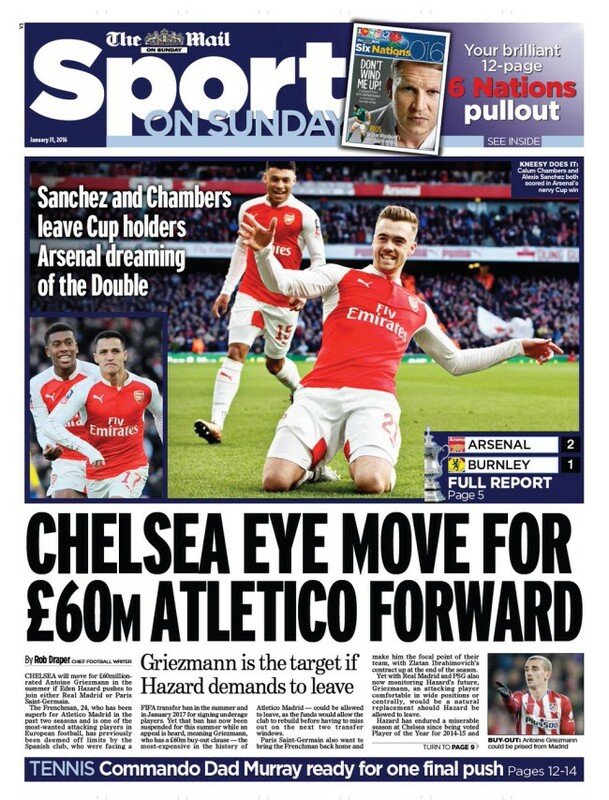 The Mail also says Chelsea are looking to spend £60m on Atletico Madrid’s French striker Antoine Griezmann in the summer if Eden Hazard moves to either Real Madrid or Paris St Germain. 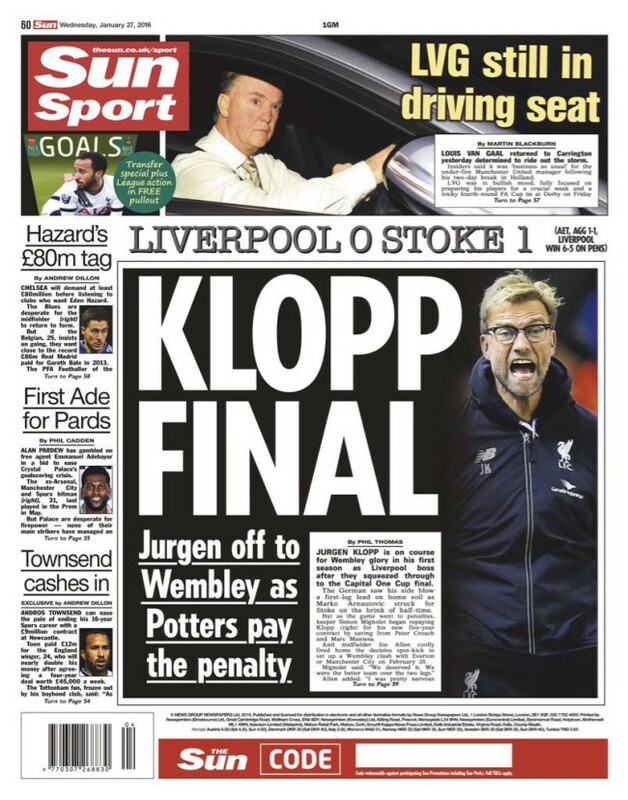 The Daily Star and Independent both lead with West Ham United and Liverpool’s 0-0 draw in the FA Cup. The Indy says a replay is just what Liverpool don’t need. Surely defeat would have been worse. But why let the facts stand in the way of a pun. So it is that Liverpool staying in the Cup is a “Hammer Blow”? 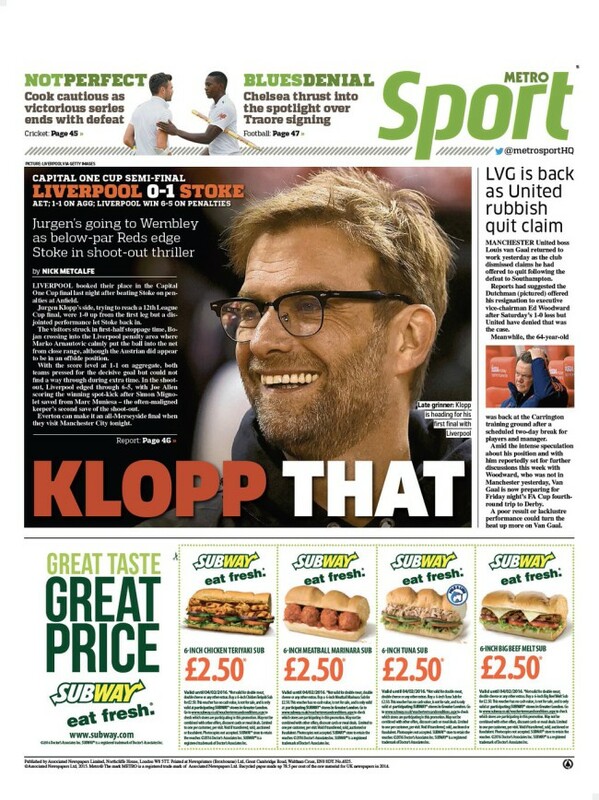 Liverpool are lucky to be in the Cup, says the Star. It says Steven Caulker handled in the area but the referee failed to give West Ham a penalty kick. You might call that a ‘Hammer blow’. The Star also says Pep Guardiola is heading to Manchester City. We know this because “Mrs Pep” has been looking at St Bede’s College, where the club have 40 Academy players studying. According to the school’s website, it is a “leading Catholic Independent Co-Educational Grammar School, founded in 1876, inspiring excellence and instilling values in pupils from 3 to 18 years.” All City’s academy players are educated at St Bede’s. 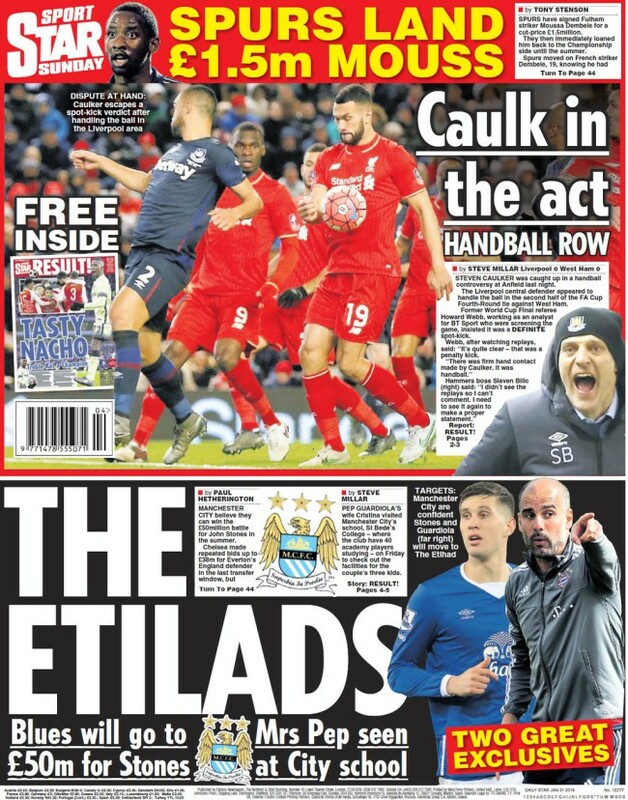 The Express leads with Manchester United, who didn’t even play yesterday. The club’s owners, the Glazer family, have ordered cuts behind the scenes with up to 15% reductions in most departments. The Mirror picks up the rumour that Manchester City are favourites to sign Everton’s £50m-rated defender John Stones. Is Manchester Untied manager Louis Van Gaal a quitter? Is he going to quit Old Trafford? Is he… Well, you get the idea. 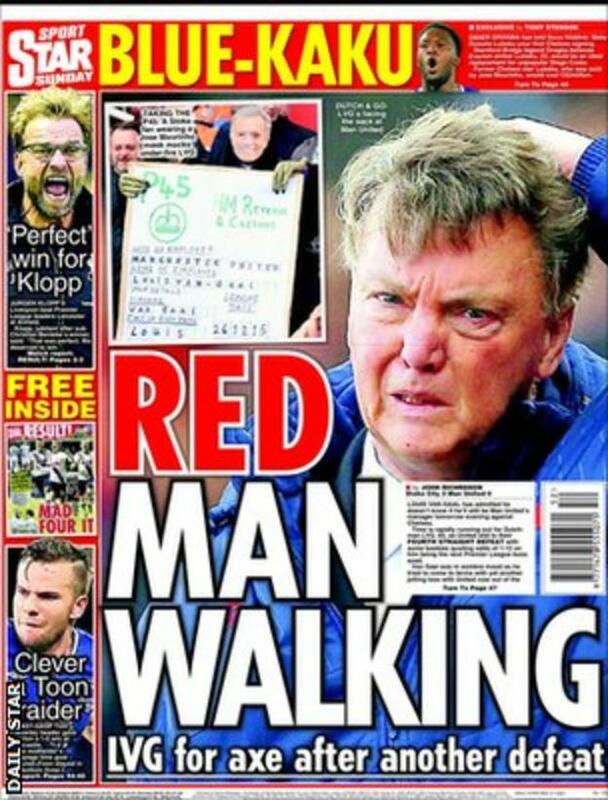 The Press are obsessed with the idea of Van Gaal leaving his job. What loon would walk out of a job managing one of the world’s great football clubs? 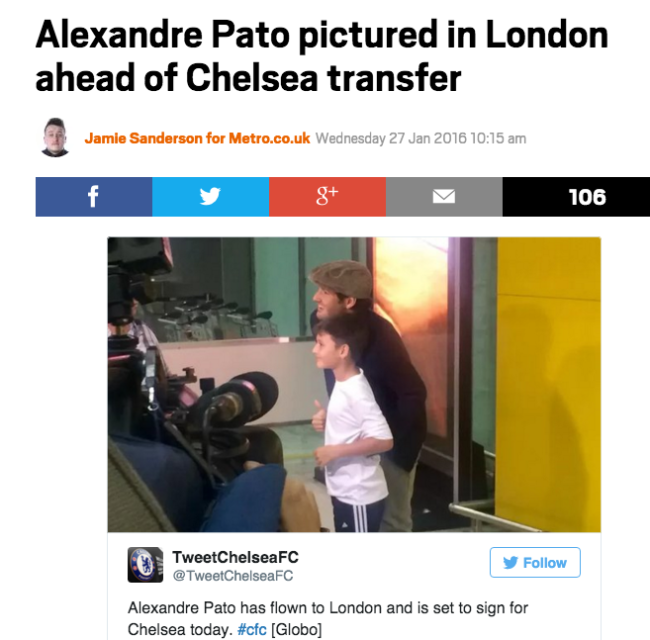 Maybe Pato has been pictured in London ahead of signing for Chelsea – but in the Metro’s tweeted phone Pato’s at Guarulhos Airport in São Paulo, Brazil. You can find the snapshot of Mr Duck on the Globo website. Desperate? What did he say when asked about assists? How did “it does not matter” become “desperate”. 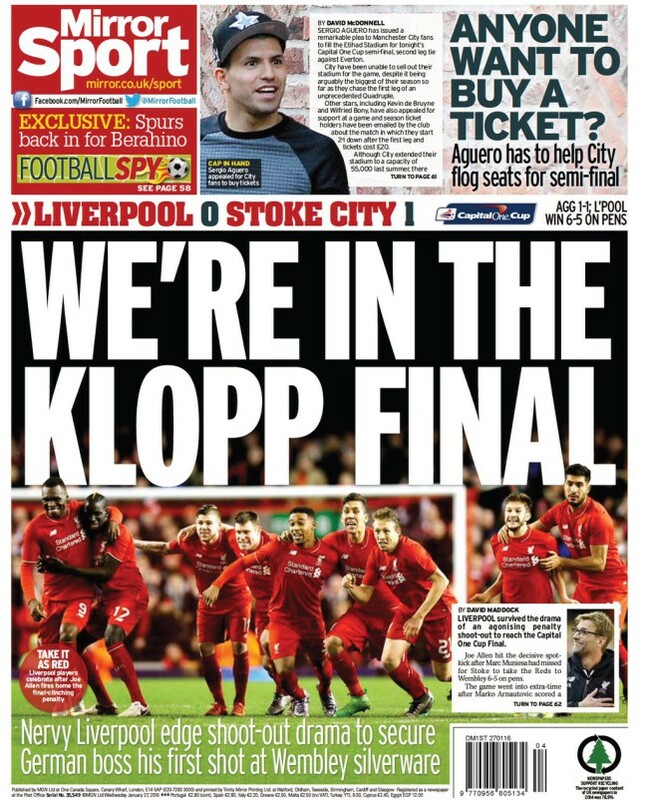 Last night Liverpool FC reached the League Cup final after a penalty shoot-out with Stoke. Let’s see which newspapers went to print before the match finished. 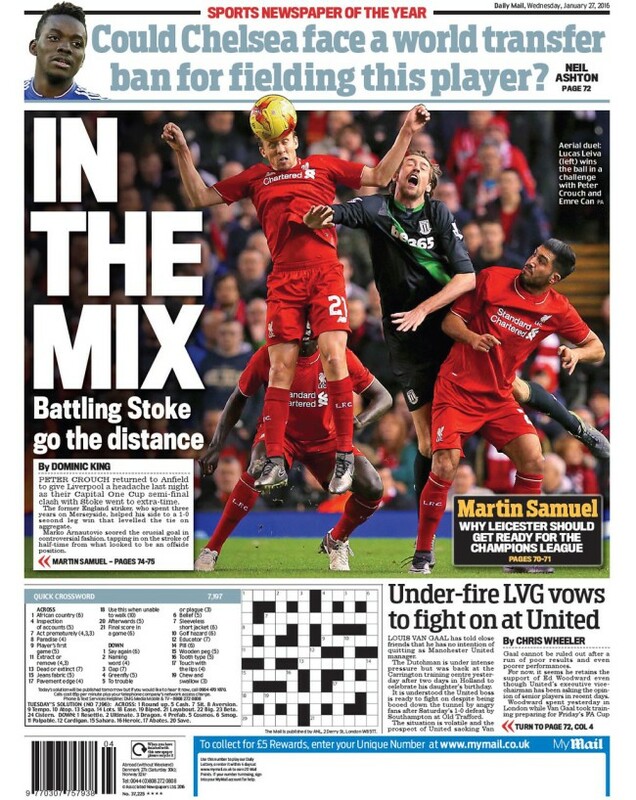 Stoke are in the mix. Stoke shaking it up. So reports the Daily Express and Daily Mail. In other news: Stoke lost. 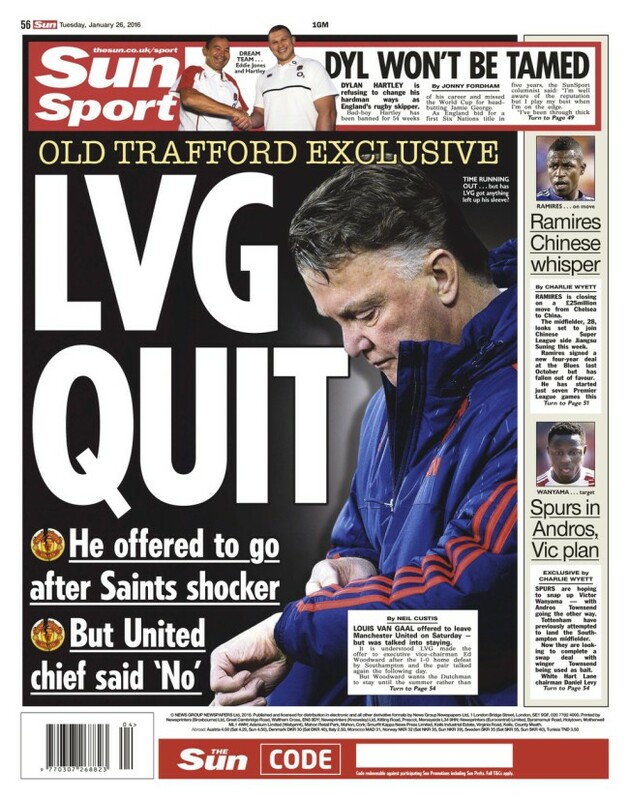 The Sun says Manchester untied manager Louis Van Gaal offered to resign but the Man United board ordered him to stay. But the Sun says it is “understood” the conversation did take place. This is the second time in under a week the Sun has been contradicted by United. The paper reported that Man United’s reps had met Pep Guardiola at a Paris hotel. United said that was balls. Either the Sun is writing nonsense, or else the club is lying. 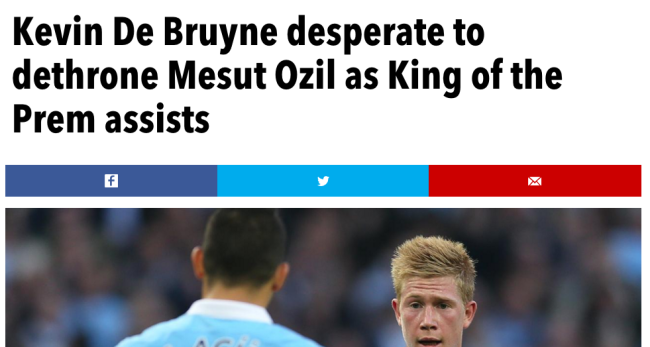 And what, then, of the Mirror’s news? 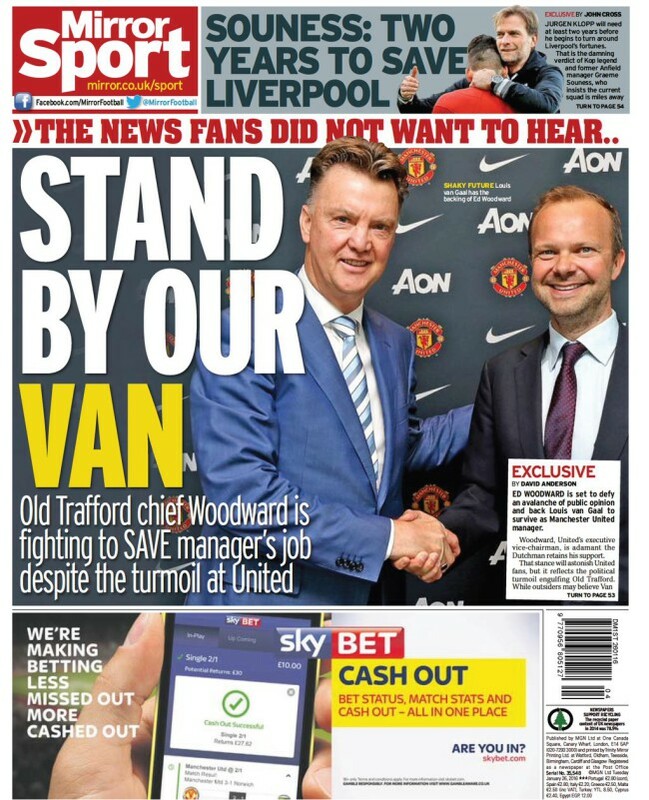 This is not only a fight over Van Gaal’s future – it looks like United dealmaker Ed Woodward is fighting to save his job at United. Following defeat to Southampton, Louis Van Gaal has let it be know that he’s “very disappointed” he is unable “to reach the expectations of the fans”. 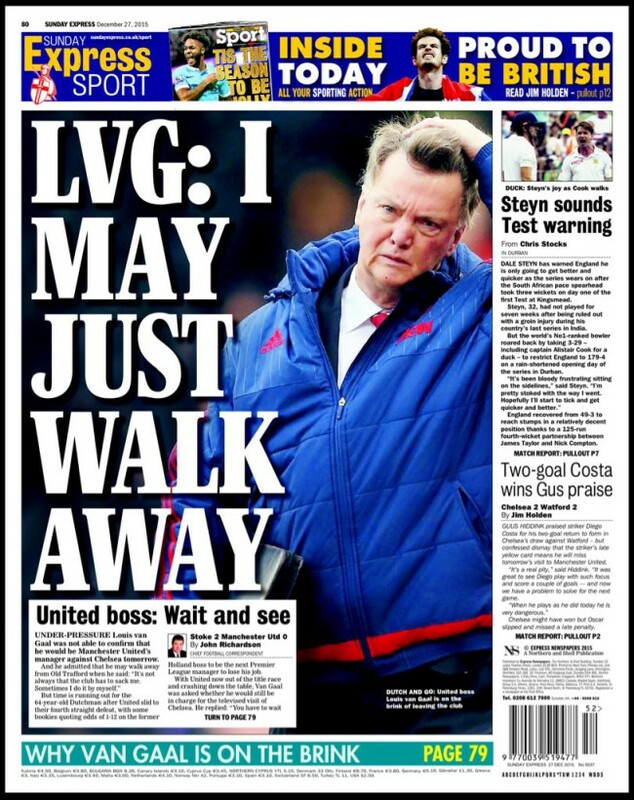 The Daily Mail (“GET Rid of LVG”), says those who pay Van Gaal are condidering ‘letting him go’. The paper says United’s executive vice-chairman, Ed Woodward, has asked senior players what they think of the Dutchman. They told him of their problems with Van Gaal. They have “stopped responding”. 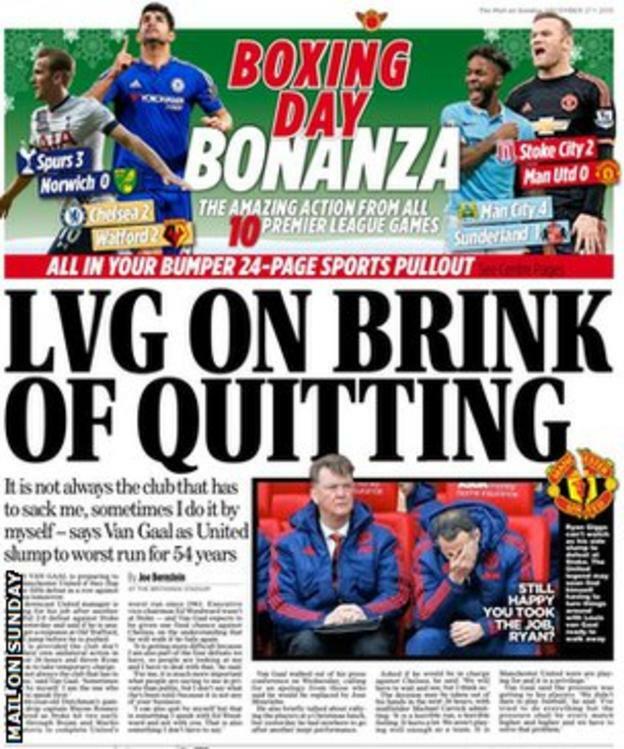 The Mail says Van Gaal’s end will spell promotion for Ryan Giggs. But Gigs wants the job on a long contract, not just to be an interim boss. Giggs is the “most likely choice”, readers are told. The Sun says it’s “GAAL OVER’. 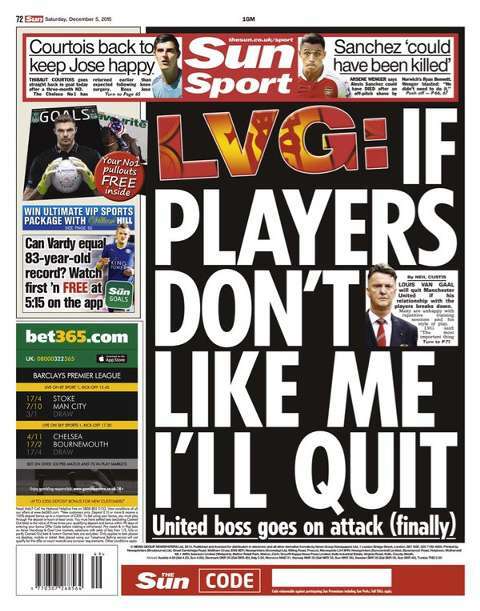 The paper says he’s “on the brink” of “quitting” United. 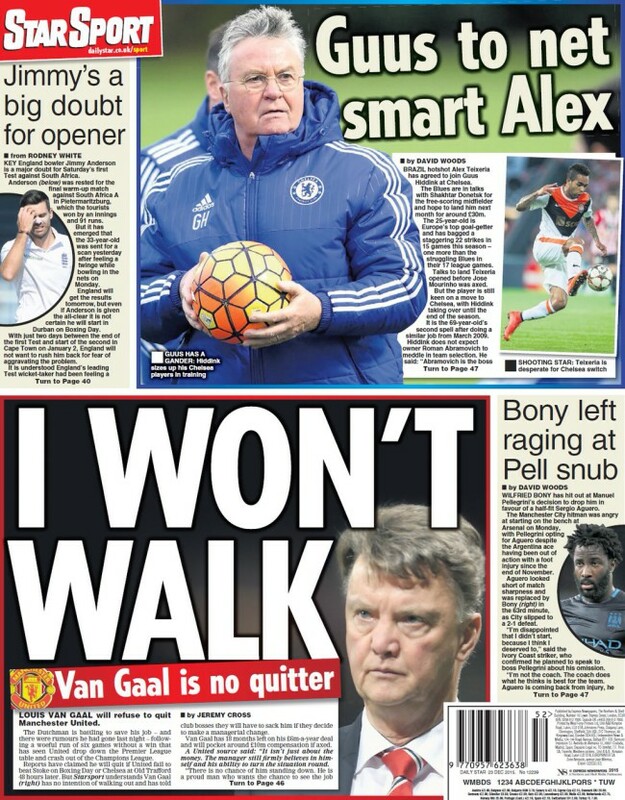 For months the Sun’s being saying Van Gaal’s been on the brink. That brink is wide and generous. 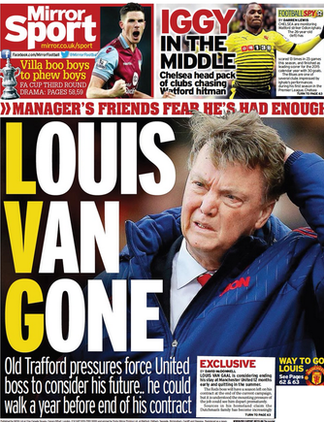 The Mirror says Van Gaal “edges closer to ending the misery”. He has “dropped a quit hint”. He hasn’t. Meanhwile, not one newspaper lead with a well cone to Southampton, who on much smaller budget than United’s, won the game. Jose Mourinho has written a “six-page love letter to United”, says the Independent. Sadly, we don’t get to see any extracts from the former Chelsea manager’s love letter. We just get told how respectful Jose is to Louis Van Gaal, the current Man United boss. Which sounds a lot of utter balls when you realise the Dutchman’s contract runs until 2017. If the letter exists, it is surely a pitch for the man’s job and with it his sacking. Is this PR dressed as a new story – dire off the missive, leak it to the Press and see what occurs? Look out for life-size cardboard cut-outs of Jose Mourinho in the Old Trafford stands. And are United fans so desperate they want Mourinho, a man who delivers silverware but in a caustic style of management reliant on slash and burn-out? Is Jose so desperate to get one over on Chelsea, keen to show the club where he cemented his reputation and from where he was twice sacked that it wasn’t him, it was them? Could any Chelsea fan stand to be on the receiving end of his snark and sneer, to see him lead United to glory? Absurd. Ridiculous. But believable. This is Mourinho who once hid in a laundry basket. He wants that Man United job. The Sun (Jan 22): “Chelsea have made Juventus boss Massimiliano Allegri, 48, their top target to take over as manager next summer.” It’s news the Mirror reported in December. Maybe Chelsea will just four mangers in one go and line them up, saving time looking for the next head coach between sackings. Much is being made of former Arenal captain Patrick Vieira ‘s selection of Jose Mourinho to manage his dream XI. Arenal manager Arsène Wenger, who brought the player to English football, is overlooked. Vieira played under Mourinho at Inter Milan for 18 months – he played for Wenger for nine years. Vieira is now carving out a career in management at Manchester City, attempting to prove his coaching potential with New York City FC, a Man City franchise. Arsenal never did come calling for their former captain. Is he bitter? 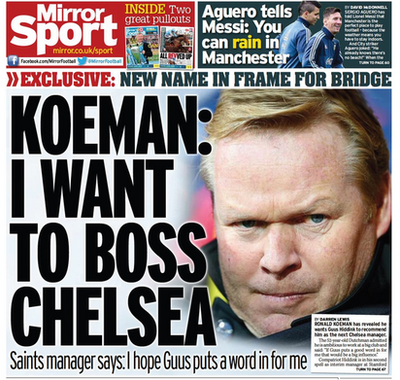 One thing the papers don’t mention is that Koeman was joking when he spoke with Radio 538. You can hear it here. Manchester United have denied reports that club officials met Bayern Munich manager Pep Guardiola in Paris last week to discuss the possibility of him replacing Louis van Gaal at Old Trafford. A report in France Football on Thursday claimed that the meeting with the Spaniard took place at the Hotel Bristol in the 8th arrondissement of the French capital last week. However, a United spokesman insisted there was no truth in the story. Mentions of France Football in The Sun’s story: nil, although, like the Express, it does mention “reports in France” as the story’s source. Either the Sun doesn’t check sources before it yells ‘Scoop!’ or else United are mistaken. Manchester United have been talking to Pepe Guardiola, the football manager who will lead whichever club he coaches to ultimate glory. 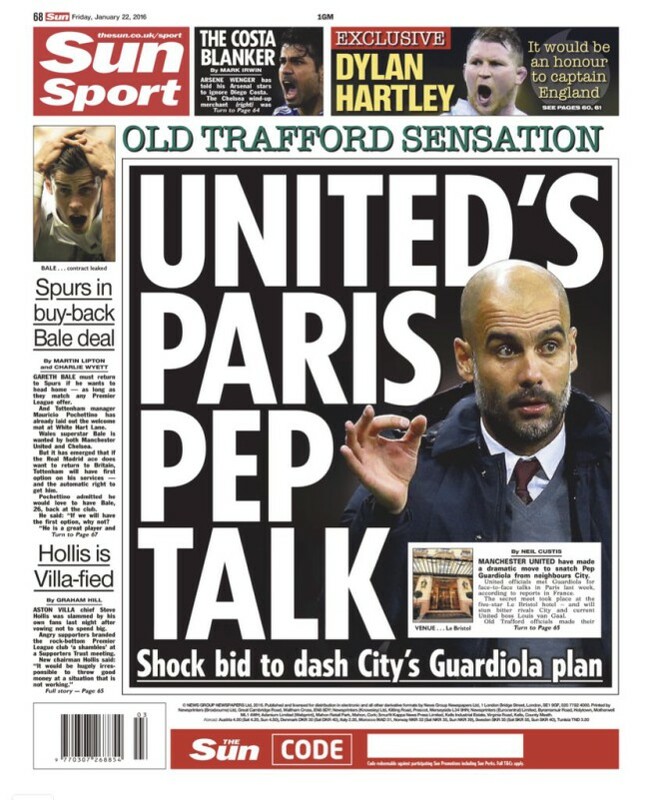 The Sun says Manchester United’s schmoozers met Pep at the “five-star Le Bristol hotel” in Paris. This was, we are told a “secret”. It is also a “shock” to Manchester City who “convinced” Pep was on his way to their place. The paper suggests Pep is reluctant to reach an agreement with City because his current club, Bayern Munich, could meet them in the Champions League. 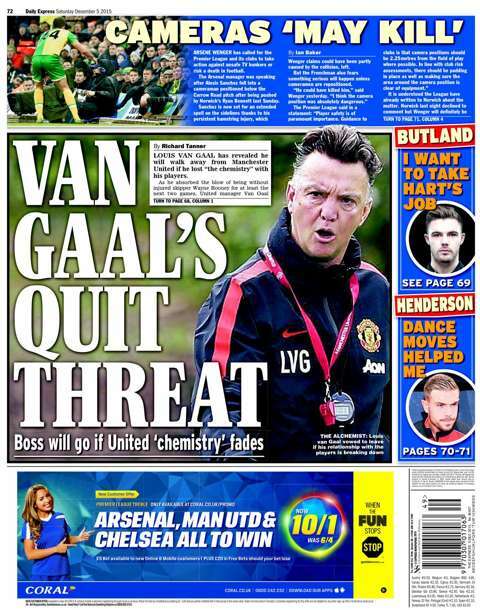 The Mirror leads with news that current Man United boss, Louis Van Gaal, is certain to leave the club in the summer. The United board have slapped him with a “transfer ban”. ll big deals are on the “back burner”. 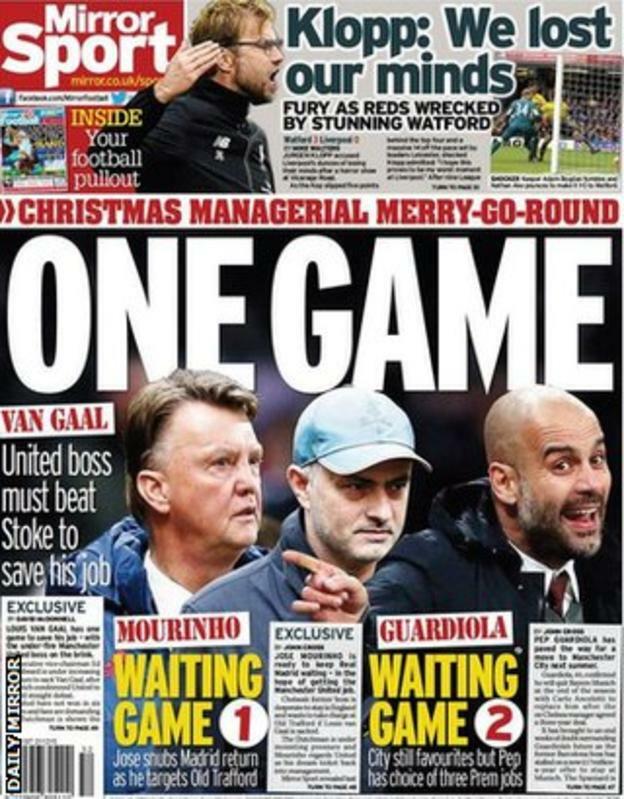 Odd because it was the Mirror that reported on December 31 2015, “Manchester United close in on £35m midfielder” and today yells: “John Stones ‘remains Louis van Gaal’s top target.” Van Gaal will bid £45m for Stones. Former Times football editor Tony Evans tells the Evening Standard that Pep Guardiola wants to mange Arsenal. Ever since he took that time off after Barca, he’s talked about clubs that attract him. It’s a very short shortlist and Arsenal are top of it. Pep is a great fit for Arsenal. But, then, so is Arsene Wenger. Pep to Arsenal looks like nothing more than wishful thinking. Transfer balls: Chelsea have agreed to pay Corinthians £8m for 26-year-old striker Alexandre Pato, says the Daily Express. Is that a good price for a lightweight but talented player who has largely failed to live up the promise shown in his early carer at AC Milan? Judging by the Pato chatter over the last few months, £8m is a snip. 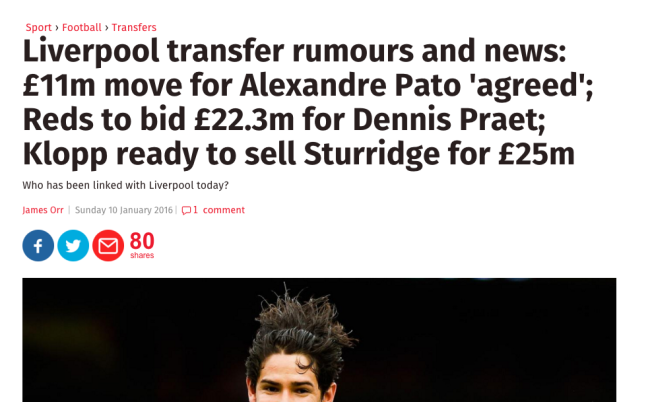 On January 10, the Independent said Pato was heading to Liverpool, albeit for £11m. Corinthians are desperate to sell Pato. Give it a week and £8m will look overpriced. Liverpool have made a move for a big-named signing. It’s Alex Teixeira. He plays for Shakhtar Donetsk. He scores lots of goals. He’s from Brazil. 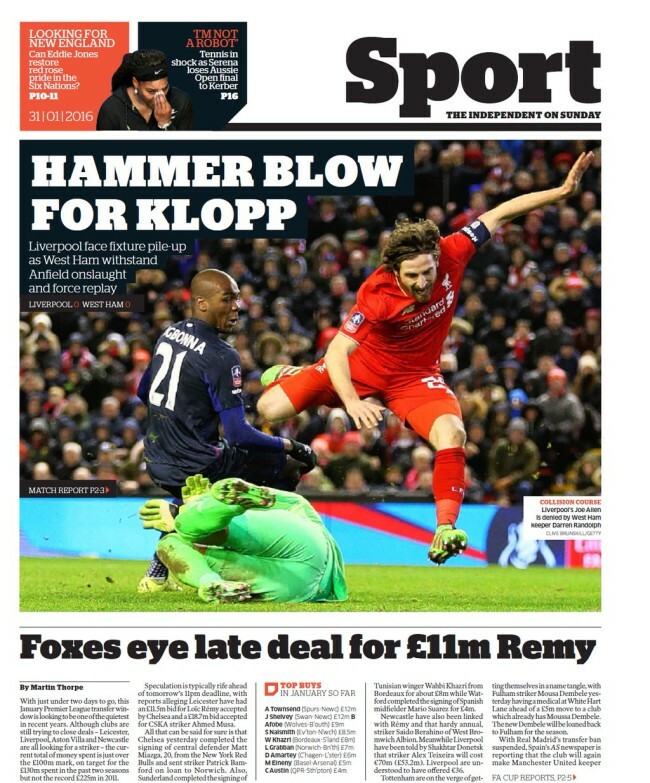 The Guardian says Liverpool have made a £24.5million bid. 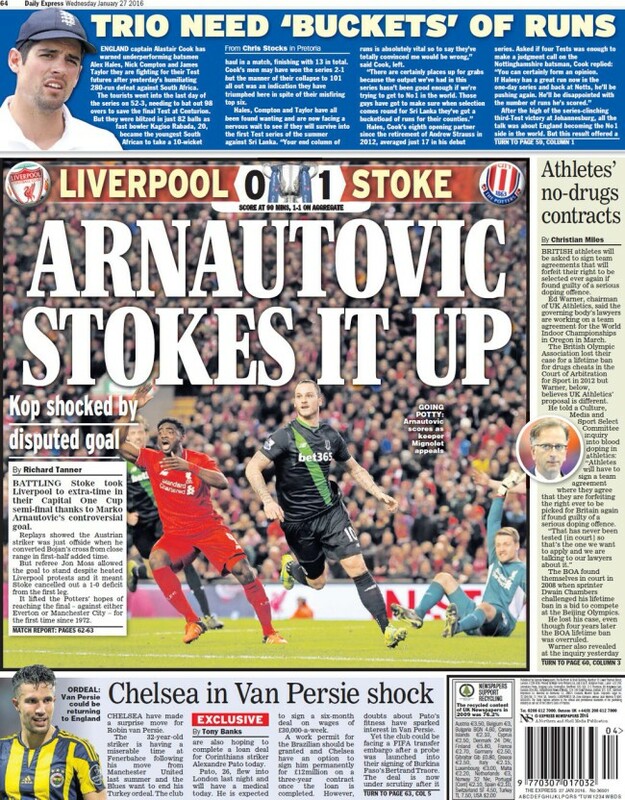 The Liverpool Echo says Liverpool can forget it because Shakhtar ‘value the player at around £38.5million. What that means, of course, is that when an English club comes knocking the player’s foreign owners looks at the massive TV deal – every Premier League team next season is guaranteed about £95m just for taking part – and bumps up the price. That explains why the Daily Mail says Shakhtar are “willing to sell for £29m”; the Daily Mirror says Shakhtar want around £36m; and The Times says Shakhtar “value Teixeira at closer to £40m”. They don’t know because the fee is because Shakhtar keep pulling the lever on the one-armed bandit. 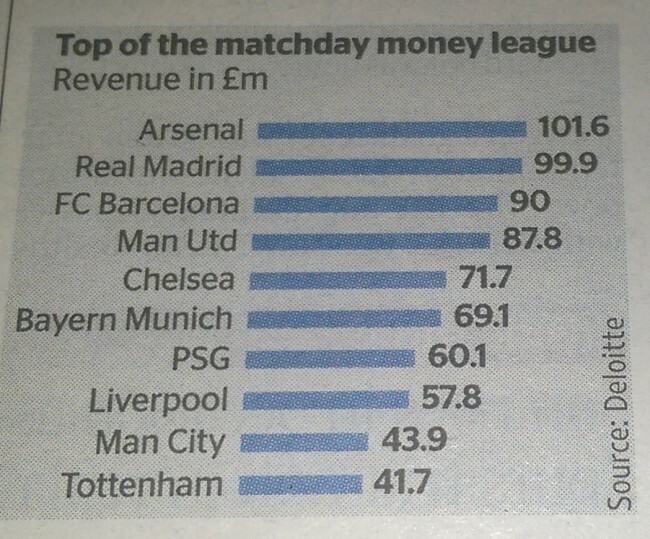 Arsenal raked in more cash from match-day activities last season than every other club in Europe. The Gunners took a whopping £101.6m, beating Real Madrid (#99.9m), Barcelona (#980m) and Manchester United (#87.8m). Given that three other clubs directly behind Arsenal in the list of top earners all boast larger grounds, it’s clear that Arsenal are getting rich on having supporters willing to pay top whack for tickets and snacks. Spurs are on their way to Wembley! Well, if they can negotiate a deal to play at the national football stadium while their new ground is being built, then yes, they are. Before that they will play at least one more round in this season’s FA Cup, having seen off Leicester City in a replay earned via an iffy penalty when the team first met. The tabloids all lead with Spurs’ 0-2 win at Leicester. The Sun – “It was the Son wot won it” – hails Tottenham’s Heung-Min Son. His goal hit the net at 54mph. Good to know. No less interesting is the paper’s dire and ubiquitous “5 Things we learnt” column, in which a football writer is tasked with the dread job of making a list to fill a space. The first point is: “Tottenham’s reserve team was far better than Leicester’s reserve team.” Not so. Of the 14 Spurs player who took part in the match, 8 played against Leicester last weekend. Leicester called on 6 from 14. Neither side was at full-strength, but to call them reserve sides is wrong. And what football writer worth their corn had to watch the match to “learn” that bigger, richer Spurs have more strength in depth than smaller, poorer Leicester? When Spurs went 1-0 up, fist-choice striker Harry Kane came on. Only with Leicester 2-0 down did Claudio Ranieri, Leicester’s manager, send on top-scorer Jamie Vardy. Two Leicester City players – Demarai Gray and Ben Chilwell – were making their home debuts. Son’s fine goal was in part down to Chilwell’s failure to close him down. It’s pretty clear that Spurs manger, Mauricio Pochettino wanted it more. Spurs march on. Leicester continue to be the season’s surprise package. Louis van Gaal is considering walking out on Manchester United this summer – a year before his contract expires… Sources in Holland claim the Dutchman’s family have become increasingly concerned at the heavy toll leading the Old Trafford giants is taking on the 64-year-old. Sources in his homeland? If he goes, then what? Van Gaal stepping down would leave the way clear for Jose Mourinho, sacked by Chelsea last month, to take over — the Special One is said to be willing to bide his time until the summer to land the Old Trafford gig. 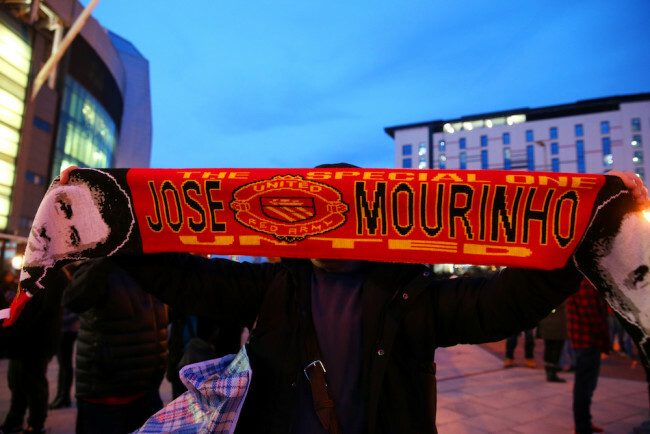 Mourinho is “willing” be manager of the biggest club in British football. Feel the humility. Why United would go for Mourinho seems odd. Maybe thy plan to narrow the Old Trafford pitch? 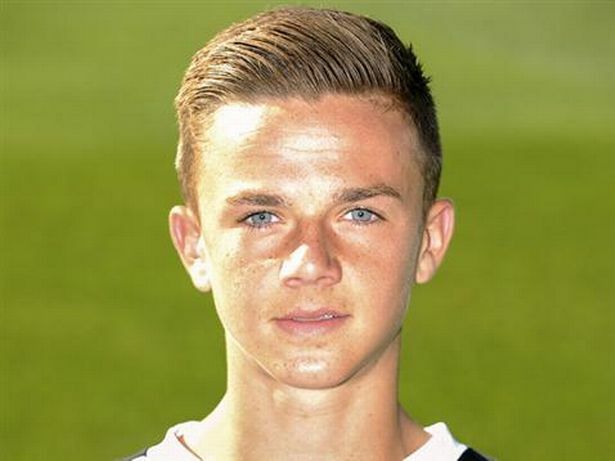 This new version of the old Alli is 19-year-old James Maddison, currently on Coventry City’s books. Everton, Liverpool, Manchester City, Southampton and Newcastle United are also in for him, we’re told. The Times says Spurs will offer Coventry £5m. But the Mirror says Liverpool are “leading the chase” for his signature, although the Reds will probably just wait for Southampton to buy Maddison and then sign him from there. The Metro says Arsenal also want Maddison and Coventry “could accept a £10m bid”. The Express agrees, saying that £10m for the “wonderkid” is a fair price. He’s talented and hard-working. No wonder the big clubs want him.